When the economy hits hard, some families cut back on grocery bills by cutting out organic things and even fruits and vegetables, and going for cheaper items that are frequently high in sugar and saturated fats. We’re all facing tough choices in this challenging economy, but I caution my patients strongly against cutting back on the best nutritional choices. Fruits and vegetables these days don’t contain the same level of nutrients as they did when we were small because of farming techniques and overall degradation of the nutrients in the soil. 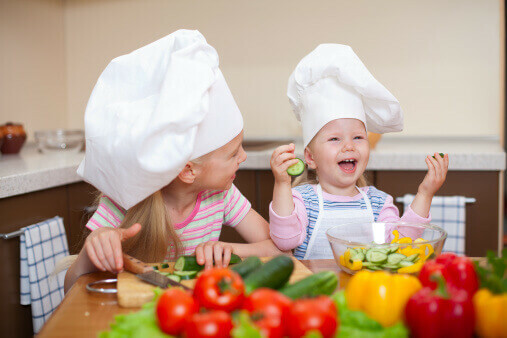 In my opinion, choosing organic foods is the best way to make sure your children get the maximum amount of nutrition out of their meals. When I made the decision to begin my Organic Journey, we took a look at our food choices to do what we could to keep the budget under control. Here are five techniques I’ve learned to help keep costs down and nutritive value up. Choose the organic foods that make sense for your family. I put together Dr. Greene’s Organic Prescription to help you prioritize the choices that your family should make. The list is progressive, so once you make the switch to organic milk (the MOST important choice), move on to potatoes (choice #2), then peanut butter… and so on. Use the Organic Essentials pocket guide for reducing pesticide dietary exposure to make decisions about your fruits and vegetables. The pocket guide presents lists of conventional fruits and vegetables that the Organic Center has determined pose the most significant pesticide-related risks and, therefore, are the most critical produce items for consumers to purchase as organic. Our family didn’t eat much meat anyway, but I found when we filled our plates with vegetarian dishes with soy and legumes instead of meat and chicken entrees, our grocery bills went down. If you’re used to eating meat at every meal, try a couple of meatless entrees a week. You’ll see a difference. Grow produce at home. We’re lucky that we live in California and can cultivate a nice-sized garden. We save on our grocery bills by growing our own tomatoes, peppers, squash, watermelon…. All the yummy favorites we love to eat. Even if you are limited to a smaller container garden, growing your own food is a great learning experience for your children and can be a cost-saver for you. And, most importantly, you get to monitor what goes into your food! Make your own organic drinks. Specialty sodas, gourmet coffees, flavored vitamin waters…. These products are pricey! When you’re looking to cut corners, use organic ingredients to create your own healthy and nutrient-rich drinks. We keep a jar of water infused with anything that catches our fancy – sliced cucumbers from the garden, crushed mint leaves, organic lemons and oranges. The healthy beverage on the counter always reminds us to stay hydrated, and the flavors keep us coming back for more all day long. We also brew our coffee at home, a special blend from Caffe Sonora which uses a special process to keep the antioxidants in the coffee! Put the money you save by creating your own flavorful drinks toward more wonderful organic choices for your family.